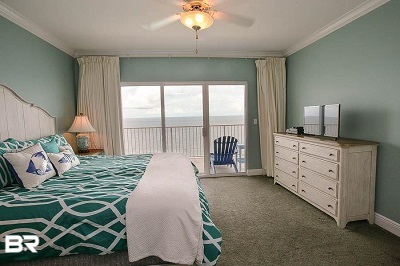 Gulf Shores Alabama condo for sale at Crystal Shores. Beautifully updated with all new Stainless Steel appliances! Sunrise in the morning and sunsets at night…You can have it all, with this 4 Bedroom, 4 Bath Penthouse! Relax and enjoy the awesome panoramic views from this spacious balcony, also from the living room, dining room, kitchen and even from both of the master suites! Awesome location! Walking distance to popular Gulf Shores restaurants & shops. Granite in the kitchen, and beautiful paint color! Complex offers indoor & outdoor pools, fitness room, game room, sauna, picnic area, WiFi, covered parking & outdoor parking lot. Fantastic rental & Investment opportunity!